Julianna Lee is an eighth grader at Demarest Middle School in Demarest, NJ. She is passionate and interested in pursuing many careers, including a CIA agent, a position with the UN, a professor, and a developer of assistive technology for people with visual impairments such as herself. Even though she has a wide range of interests, Julianna is sure of one thing: she wants an active, dynamic career in which she can work to help society and make a true difference in the world. Julianna has always loved thinking up stories and characters and writing them down. An experience in third grade made her think for the first time that her writing was good and that she had a talent for it when her teacher commented that the technique Julianna used in her writing wasn’t something many third graders knew how to do. After the experience, she began to write more and more. She wants to continue to write and finds it fascinating that she can entertain, inspire, and share her ideas with others through her words. Julianna discovered the Writing for Peace contest through an English teacher in the area who saw potential in her and found her a list of contests to enter. Julianna has always been interested in the views of people from different backgrounds and political systems. 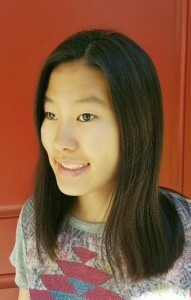 She is also South Korean and grew up hearing about North Korea. She wants to thank Writing for Peace for giving her an opportunity to explore her passions and learn more about a country close to her heart. This story is seemingly simple, yet involves writing mastery. Set in North Korea, the story involves the growing menace of a PUST student’s longing to burst through the restrictions of his given role. The main character catches a whiff of freedom while listening to a recollection of youthful rebellion of an American teacher he admires. We feel his inner turmoil and guilt because he should not be interested in such freedoms. What the author accomplishes here is subtle yet perfectly drawn. Lee’s winning story will be featured in our 2017 edition of DoveTales, An International Journal of the Arts.